The locality takes its name from the creek of the same name which flows through the locality into the Brisbane River at Savages Crossing (27°26′38″S 152°40′13″E﻿ / ﻿27.44385°S 152.67032°E﻿ / -27.44385; 152.67032﻿ (Savages Crossing)), where Banks Creek Road has a bridge over the Brisbane River. Banks Creek Road is the main route through the locality. The Brisbane River forms the south-western boundary of the locality. A sawmill was built in the district in 1911. In 1927, flooding of the Brisbane River cut a deep channel in the river where Banks Creek Road crossed the river. A low-level bridge was built by Mr Davidson, junior, to enable traffic to cross. In the 1930s, Banks Creek became known for its high-quality Cavendish bananas. 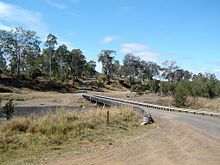 ^ "Banks Creek (Brisbane) (entry 41381)". Queensland Place Names. Queensland Government. Retrieved 7 June 2014. 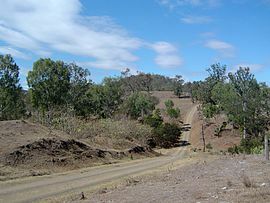 ^ "Banks Creek (Somerset) (entry 44834)". Queensland Place Names. Queensland Government. Retrieved 7 June 2014. ^ "Local Government". The Queensland Times. National Library of Australia. 12 June 1911. p. 6 Edition: daily. Retrieved 9 June 2014. ^ "DALBY". The Brisbane Courier. National Library of Australia. 26 July 1927. p. 8. Retrieved 9 June 2014. ^ "FERNVALE BANANAS". The Queensland Times. National Library of Australia. 24 December 1935. p. 6 Edition: DAILY. Retrieved 9 June 2014. ^ "FERNVALE". The Queensland Times. National Library of Australia. 28 March 1940. p. 2 Edition: DAILY. Retrieved 9 June 2014.